I never would have guessed that Sonic the Hedgehog and Archie Comics would be the ones to revitalize my interest in superhero comics. For reasons I won’t go into immediately, I walked away from both Marvel and DC in 2009/2010. They simply stopped telling the kinds of superhero stories I wanted. 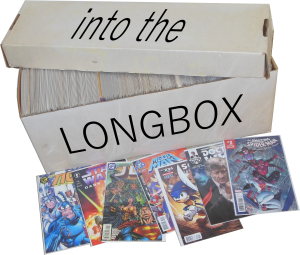 When Humble Bundle featured a selection of Sonic the Hedgehog comics as their digital book bundle, I thought it was a good opportunity to stoke my son’s interest in reading in general and comics in particular. I read the first book just to see what Sonic looked like these days. It hooked me instantly. I remember when Sonic the Hedgehog premiered in Archie Comics back in 1993. I considered it a kid’s book, with goofy artwork and the kind of four page gags for which Archie Comics was known. The new Sonic book I read was from 2013. It began with Sonic and Tails fighting for their lives against a tentacular mechanized horror controlled by a sinister and murderous stuffed doll. The book slowly introduced me to the principle cast, only a few of whom I knew from the cartoons and video games. 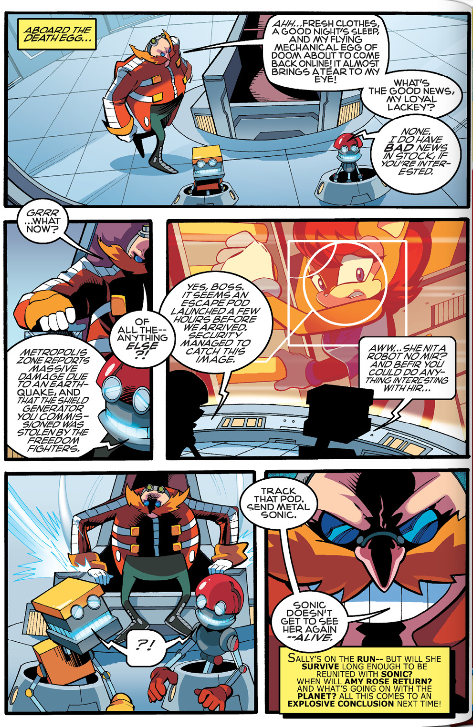 It hinted at a history of loss and sacrifice, implying that Sonic and the Freedom Fighters were all that stood between the Eggman Army and total subjugation of the world. 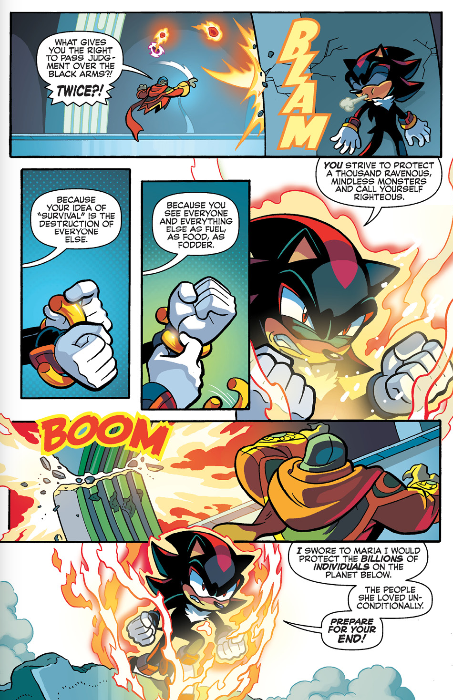 I never really considered Eggman a villain to be taken seriously, knowing him only from the video game character model and the goofy dialog of the cartoons. The comic introduced me to a man consumed by selfishness and his own ego, commanding minions that were obviously terrified of him. It wasn’t until Eggman defeated a G.U.N. carrier fleet all by himself that I began to consider him a threatening antagonist. He clearly had his eye on the big picture, with the resources and ability to follow through on his threats. I still didn’t like the character model, but it had improved significantly since the 1990s. 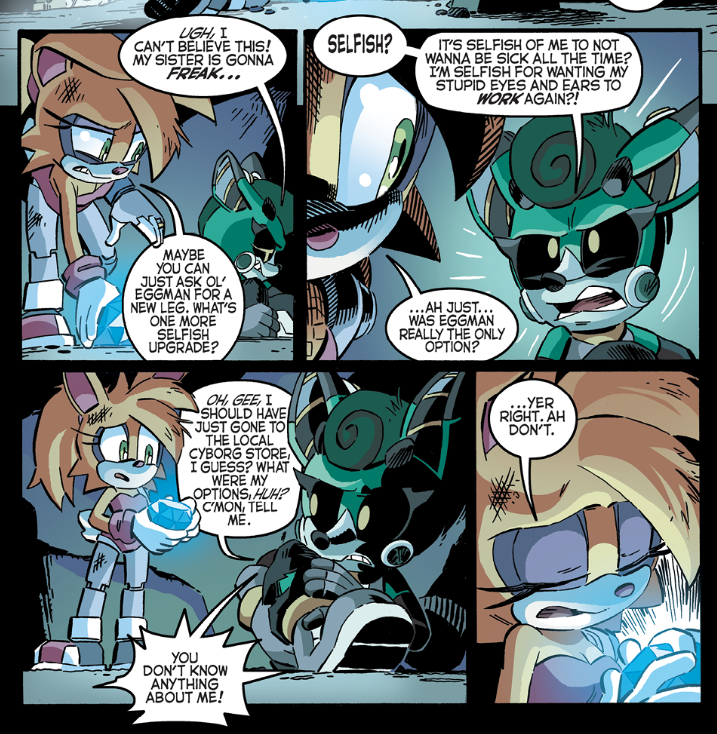 As I read, Sonic laid out the bones of what had come before and introduced me to the current status quo. Turns out I was coming in on the heels of a continuity restructuring; it was convenient for me, as I knew nothing of the previous stories. Prior to the reboot, Sonic’s Freedom Fighters had suffered devastating losses. Antoine D’Coolette was in a coma. Antoine’s wife Bunnie had lost her cybernetic powers and run away. Sonic’s love interest Princess Sally Acorn had been transformed into a murderous, roboticized slave of the Eggman Empire. Currently, the Fighters were scattered across the face of the planet, conveniently allowing Sonic and Tails to reintroduce them one at a time. I swear this used to be a kid’s book. I had two titles and three years worth of issues in each one to catch up on. I read through them all in a week. Rather than the silliness I associated with the Sonic cartoons, I discovered a complex world where a small band of extraordinary individuals stood against extraordinary threats. The villains acted with viciousness and desperation. The heroes stood ready to sacrifice everything. The fallout of their battles left ragged lives in its wake, even when things worked out mostly for the best. 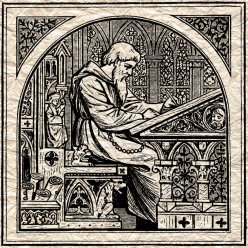 Hero and villain alike struggled with the moral, emotional, and philosophical consequences of their actions. The action was relentless; the violence was usually subtle and occasionally shocking but my youngest nephew could read this without my very protective sister batting an eye. From this point on, every superhero book I ever read will be held to a standard set by the adventures of an anthropomorphic hedgehog and his egg-shaped nemesis. Archie’s stable of artists draw the book with clarity and emotion, staying consistently on model. The color palettes tend to show their video game origins, with bright, vibrant hues that pop off the page for most of the action but turn subdued when things trend towards the serious. The lettering is a bit larger than I’m used to but it makes the books considerably easier to read in digital or digest formats. I’d never heard of writer Ian Flynn before reading Sonic the Hedgehog. 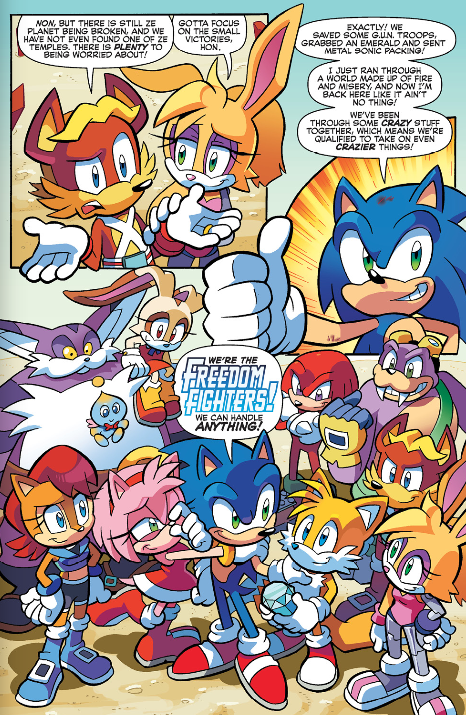 He took over the Sonic titles in 2006 and also worked on several other books for Archie, including the New Crusaders. He also wrote every issue of Archie’s Mega Man series, which I’m now determined to hunt down and not only for the two epic crossovers with Sonic. I used to think this was just a kid’s book, but it has rapidly become my superhero title of choice, surpassing even Grant Morrison’s luminary work on JLA in the 2000s. I regret not having discovered it sooner. Archie Comics has made every issue of both Sonic and Mega Man available digitally through their own app and through Comixology. They also publish the older works in digest collections and the new works in trade paperback. 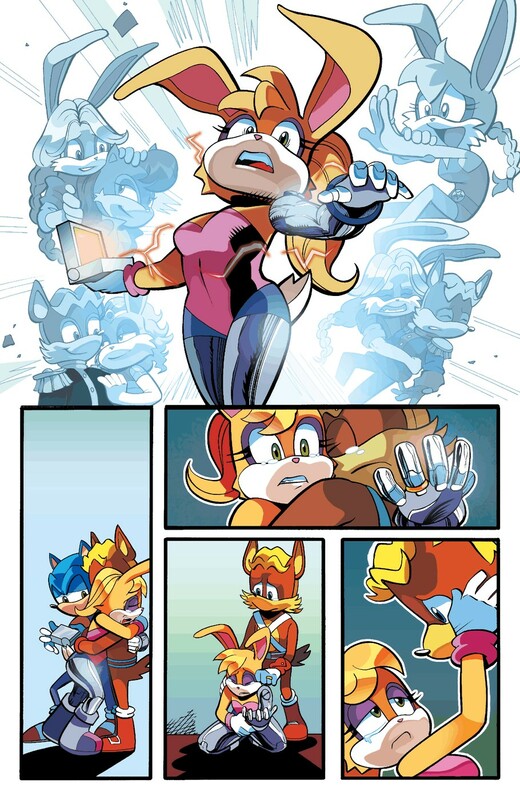 The Sonic titles are currently on hiatus while Archie Comics and Sega talk through some licensing issues, but you can bet I’ll be there to pick up the next issue when things finally resolve. In the meantime, Archie has most of the trades on sale through their website and special deals going through their digital outlets. It’s a great opportunity to catch up on the stories, starting with the TPB “Countdown to Chaos” or issue #252. 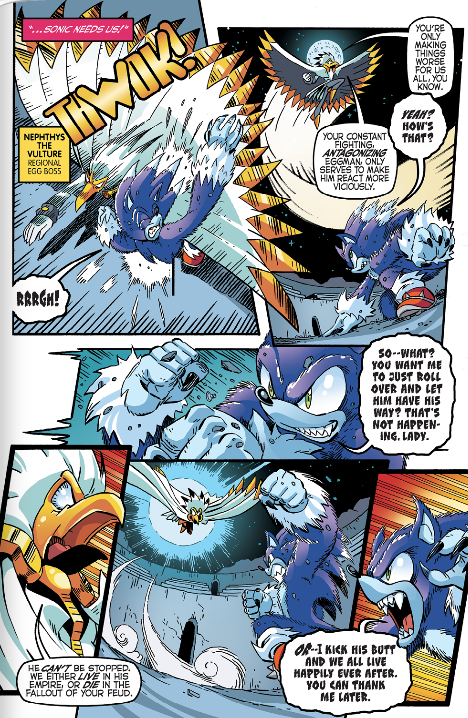 If you are a fan of superhero comics, action-adventure stories, or simply have the ability to read, you need to be reading Sonic the Hedgehog. I give the two Sonic books, Sonic the Hedgehog and Sonic Universe, Quality scores of “Superior” and Relevance scores of “High”.